The winter has receded for some, while others are still fighting the cold. Wherever you are and whatever the temperature is, remember that there is always a great reason to forget the weather completely! Stay inside and play some Genesis, and you’ll never have to worry about being too hot or too cold! Every so often, I like to return to the classics. I really love a lot of those early Genesis releases, and my favorite is definitely Ghouls ‘N Ghosts. Many people prefer the SNES sequel, and I recognize that it’s technically superior, but I think the Genesis game plays better. I’ll take the vertical shot and spot-on jumping over the double jump any day. All the infamous challenge is there, and it’s brutal to have to go back and do the whole game over again, but Capcom really got the dynamic down pat with this game. The original was just brutally hard to pass two times, and Super Ghouls ‘N Ghosts is just far too long for me to do twice in a single sitting. Ghouls ‘N Ghosts is just the right length, making it one of those games that puts you “in the zone” when you’ve really got your mojo flowing. It’s why I keep coming back to it. I had a very exhausting but satisfying weekend this final weekend of April. A friend and I, with the help of fellow forum member and a pal of his, had set up a Genesis showroom at the “Lange Nacht der Computerspiele,” a Retro computer/console event in Leipzig. We had quite the nifty layout going, including (but not limited to) a 10-player setup of Saturn Bomberman (which literally was a blast, culminating in not one, but two impromptu tournaments), a dual-lightgun display of Virtua Cop on the Saturn, two keyboards hooked up to a Dreamcast for an ongoing session of “Typing of the Dead,” and a browsable copy of Mega Drive/Genesis: Collected Works. There was also a complete Mega Drive 32XCD station, drawing in a multitude of reactions like curiosity, amazement, and wonder, as well as a little bit of sneer whenever someone who wasn’t in the know before learned about the cables and power adapter situation. Really, the only things missing where a Pico and a Sega SG-1000, but at least those were displayed down in the lobby and behind glass. Anyway, there was hardly a moment when a console wasn’t occupied by someone enjoying some good old retro gaming from the Sega console years. There was quite a lot more to enjoy at the event (I spent quite a lot of time with the soccer-playing robots or at the complete setup of Steel Battalion myself), but I also managed to sneak in a few quick Sega gaming sessions myself. One of the highlights though was definitely the spontaneous decision to hold a 16-player Micro Machines 2 tournament. The game had drawn in crowds of both gamers and watchers the entire day, and about seven hours in after the convention had started, the decision was made to turn the game into a small competition on short notice. The victor – whom I personally had to yield against in our semifinal match up – even got one of the old “championship certificates” that were included in the original release ^^ (oh yeah, and we also managed to scrounge up a price for the champion as well). I better stop myself here, because honestly, I could probably go on for hours about the event, not just our Sega showroom but also about everything else on that con (if you ever wanted to try out a Virtual Boy, see soccer-playing robots in action, try your hand at a complete controller setup of Steel Battalion, play a game of Dance Dance Revolution to SID chip tunes on a Commodore 64 using the original DDR mat, or use a racing wheel as a controller and more realistic tilting physics for a game of Tetris, this was just the place). It was a really long night… and a great day. As some of you might remember from my “Stories” entry a few months back, I lived in a small town for a while that was very Nintendo (and eventually Sony) friendly, but not overly kind to those of us who were SEGA fans. Even during that few year period where used SEGA games became a hip thing to sell at pawn shops and such, I still missed out on quite a few titles with the Genesis. Back then, I was a big-time shmup fan. Hold down the button and shoot the ever-loving piss out of anything that isn’t you, while layers of parallax scrolling go by and hordes of enemy ships and characters come at you with bullets blazing. As such, it’s no surprise that while I was living in that town, a particular port from the Neo Geo caught my eye in the December of 1994 issue of GameFan. It got good scores (8s and 9s) and seemed pretty interesting. But alas, it never seemed to show up where I lived; not even used as far as I could tell during the aforementioned SEGA popularity boom. In fact, I had to go some 100 miles away to eventually get it. Now hold on, I’m not a crazy person. I didn’t drive all that way just to get a game. But someone did drive into me, which ended up allowing me to get said game. Long story short, a few years after that GameFan article, my dad and I were rear ended while waiting to turn left. After several months, my mom and I had to go all the way to a different city to get my physical therapy bill handled. Why? Because that’s where the person was from, and their insurance provider didn’t have a branch in the town I called home. So, we had to drive 100 miles to a “nearby” city (the twit on the phone called 100 miles “nearby”… that’s like car commercials saying “for only $23,999”) to take care of the finances for the physical therapy I’d been getting for my neck injury (which never fully healed, sadly). But, while we were down there, we just happened to be near a large mall. So, in we went after everything was done at the insurance office so we could relax a little and grab some food before heading home. There, I found an Electronics Boutique that had all kinds of Genesis titles. They were spine up along a shelf behind the checkout counter, and I was able to get close enough to read the titles. I saw stuff like Light Crusader, Joe & Mac and other such titles, but it was the game at the end of that lineup that grabbed my attention. I asked if I could see it, and the clerk handed me Viewpoint. I was pretty happy to finally get to see a copy. According to the clerk, they’d had that one copy in stock in the back for a long time, which is why there was a fair bit of dust on the top of the clamshell case. I felt even luckier that it was $9.99 and still sealed in the cellophane. Needless to say, I bought it and left the store. On the way out of the city, we passed by a Toys “R” Us and decided to stop in there since that chain wasn’t in the town we called home. I mean hell, we drove 100 miles, so we may as well stop in while we’re there, right? I picked up cheap copies of Galactic Attack and Shining The Holy Ark for my Saturn there, and then we stopped off at a used game store that we’d passed by on the way into the city, where I found a used and complete copy of Shining Force II. We headed home after that, with me looking through the game manuals and eager to play the games I’d gotten. The first one to get plugged into a system once we were home? That was Viewpoint. As my review here shows, I enjoyed it. Sure, it has a fair bit of slowdown and flicker, but it’s still a good game. Nice graphics and music, good controls, a solid challenge… it was a surprisingly good port, considering how much less memory the Genesis game had compared to the Neo Geo original. It’s not quite on par with the black magic Takara used with some of their good Neo Geo ports, but Sammy wasn’t too far off with their effort. What brought this little tale on, you may be wondering? I’d just sat down to play it again a few days ago, after not touching it for a good while. Figured it was time to take it for another spin, and that got me thinking about what went on that led up to my owning it. So yeah, I got the game and three others, which made the trip worth taking. And while I’m glad to own it, it would have been nice if I could have skipped the whole “get hit by a car” thing and gotten it via a less physically detrimental manner. Vapor Trail and Steel Empire are my go to shooters when I feel the need to blast something. My original plan this month was to cover Fatal Fury, along with a few other fighting games, but Vapor Trail was calling to me one day when I had some time to kill which worked out as I hadn’t beaten the game on hard without using an auto-fire controller. What a difference turbo can make. For the last two weeks I’ve been consistently annihilated around the mid part of stage five except for the one day I started writing this submission when I finally made it past that section to the final boss only to be annihilated instantly in the first hail of gunfire and missiles. With an auto-fire controller and the first S-Unit pickup, Vapor Trail can be a breeze on both easy and hard difficulties. Without the benefit of turbo it becomes a real test of dexterity and power up management as each of the main weapon upgrades used correctly on the right stage can make a huge difference. One of these days I’ll stop making stupid mistakes and finish this one on hard. Until then I’ll keep donning my stereo headphones and blasting away to one of the greatest music themes ever in a shmup. Sonic is back, and bigger than ever! Bigger than the screen actually. He runs through enemies with invincibility from his giant size, leaping high over the stages, and landing with a ground-shaking crash! Released late July 2012, this hack flew under my radar completely, until this past month! I discovered it while browsing YouTube videos, and it sparked my curiosity because it seemed impossible on the Genesis hardware. Plus, I thought I already knew about all the 16-bit Sonic hacks out there! Wondering if this hack was even real, I searched and found its brief description and download link on Sonic Retro’s website, on a page listing every project created by the prolific hacker known as MarkeyJester. (Click here for the link.) This is considered a proof-of-concept hack, which is why it has so little attention online, and which explains why I had never heard of it before. 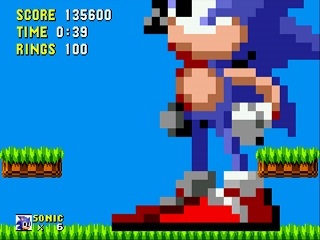 Nevertheless, all stages of Sonic The Hedgehog are present and very playable! Sonic can run freely most of the time, and despite his super size, he does not get stuck in tight spaces, because he can usually smash his way through. Some blocks and springs will fall away at his slightest touch, and a lot of the stage structure seems open to him running right through it, instead of potentially getting stuck by walls, ceilings, etc. The gameplay experience is surprisingly fluid! The giant sprite is constantly amusing, with huge rectangular pixels clashing with everything else around him. While running, his shoes are red streaks across the screen, and while rolling, his classic spinning animation fills the view, flashing blue. This has been a very fun way to revisit the first Sonic title, including the regular codes for level-select and debug mode. I have especially enjoyed revisiting Starlight Zone as an old favorite of mine, for its gratuitous loops and its fantastic music. This hack shows how much potential there still is for breathing new life into the classic Sonic series!